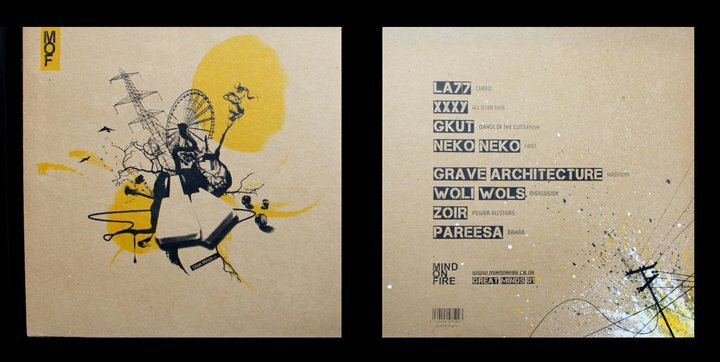 The first official release on Mind On Fire Records and the first release on wax, this 8 track LP brings together eight producers currently operating out of the city and attempts to give a snapshot of the Manchester underground in 2011 whilst not being bound by BPMs or sonic bias. Limited to 500 copies, each record is individually screen printed and hand stamped for that unique feel. Debut release from a long established Manchester posse of artists/DJs/producers/musicians including XXXY, LA77, and Woli Wols among their ranks. Many of you should be rightly intrigued by the XXXY track ‘All Over This’, one of his dubbed out Technoid Funky specials, while Grave Architecture also impresses with the skittering post-garage programming and choice oriental melodies of ‘Hassium’. Elsewhere, LA77 gives a lurching dubstep cut with warm ambient pads on ‘Cubed’. Special mention to the lovely screenprinted sleeve, too!